Guinea at the age of 5. He moved to New York with his family for a better life and education. At the age of 18, he Steps foot on a track for the first time in his life and joins the track team at Dewitt Clinton High School in the Bronx, NY. 18 is an extremely late start for any athlete. After 8 months of training Nabie only runs the pedestrian times of 11.76 in the 100 meter, 24.22 in the 200 meters and 54.10 in the 400 meters. With these slow times as a senior track athlete, there were plenty of jokes and discouragement from many people for him to quit the sport, but that wasn’t in his character. All of the critics and doubters just fueled his fire even more, and so he took on the challenge and set the enormous goal of becoming an Olympian in the 100 meters in 2004 in Athens, which seemed ridiculous at the time. In just 1 short year Nabie improved his times to: 100m = 11.16, 200m = 22.85. That is 0.60 seconds in the 100 meter and 1.4 seconds in the 200 meters. If you are not familiar with sprint times, these improvements are huge. The 100-meter time improvement is the equivalent of improving in basketball from an average of 5 points per game to 20 points per game. He becomes a first-time All-American in the 100 meters and runs an amazing time of 10.57, again another huge improvement of 0.60 seconds in just a year. He breaks his school records in the 100m, 200m, 300m, 400m and triple jump. 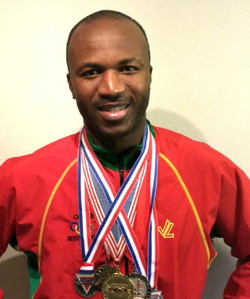 He realizes his goal, the amazing dream of becoming a first-time Olympian in the 100m and 200 meters for his native country of Guinea, with personal bests of 100m = 10.47, 200m= 21.05. He is also the flag bearer during the opening ceremonies. He makes his second Olympics in the 100 meters but this time he has company; his sister Fatmata Fofanah who was a multiple time All-American hurdler at Georgia tech alsoTechlifies in the 100m hurdles, one of the proudest moments in their family history. He gets hired at the top gym in New York (Chelsea Piers), as a specialized Speed, Performance and Muscle Toning Coach. Radenko Miskovic was born in Belgrade, Yugoslavia. Present day, Serbia. -He starts his sports career with soccer, he then follows by playing basketball, track and field and swimming. He later takes swimming much more seriously. After being rejected by the elite coaches that did not believe in his talent, he overcomes this and still goes on to succeed in swimming and places 3rd in the 50m freestyle at the National Junior Swimming Championships of Serbia. After years of grueling training and injuries, he explodes on the national scene by winning the 50m butterfly at National swimming championships, two years in a row. Set national swimming record as a 4x50m freestyle relay member. Spent a year in Caribbean island of Saint Martin, working in the fitness industry. Arrived in New York City with the determined goal to become one of the best speed and sports performance coaches in the world. He begins working at Chelsea Piers and training athletes of all sports as well as the everyday fitness enthusiasts. He proves his brilliant coaching mind by turning, Paul Dedewo, a division 3 athlete into the Nigerian National Champion in the 400m, with an unheard of time improvement from 48.15 to 45.41 and 21.81 to 20.53 in the 200m, in just one year time. He begins working with athletes of other sports on speed and conditioning, including professional boxers: Gary Stark Jr. and Jonathan Cepeda. He even trains himself to qualify for the U.S. Clubs National Championships in track and field in the 200m. His eagerness for more coaching success and higher level athletes drives him to move to LA to work with Nabie Fofanah in building the Speed Doctor athletics training revolution. 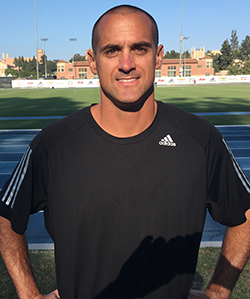 He coaches the sprinters at Pacific Palisades High School and improves their times by a huge margin.